Erasmus+ is the EU program for education, training, youth and sport. It began in 2014 and replaced the European Union’s Lifelong Learning Program LLP (2007-2013). In the field of higher education, Erasmus+ provides opportunities for students, higher education institutions, university staff and partners from non-academic sectors. In addition, the program strengthens the cooperation between schools, enterprises, adult education institutions, and youth organizations. At the moment, all 28 EU member states as well as Iceland, Norway, Liechtenstein, Turkey and the Former Yugoslav Republic of Macedonia participate in Erasmus+. JGU also successfully applied to participate in Erasmus+ and concluded bilateral, subject-specific Erasmus agreements with about 350 universities. Within the frame of these agreements, JGU students have the opportunity to study abroad at one of our European partner universities. Moreover, students may receive financial support from Erasmus+ funds during an internship in another participating country. The seven year program has a budget of €14.7 billion. More than four million people will receive support for studying and working abroad. National Agencies (NA) award the funds for mobilities and strategic partnerships. In Germany, this task is carried out by the German Academic Exchange Service (DAAD). The DAAD also provides further information on the Erasmus+ program. 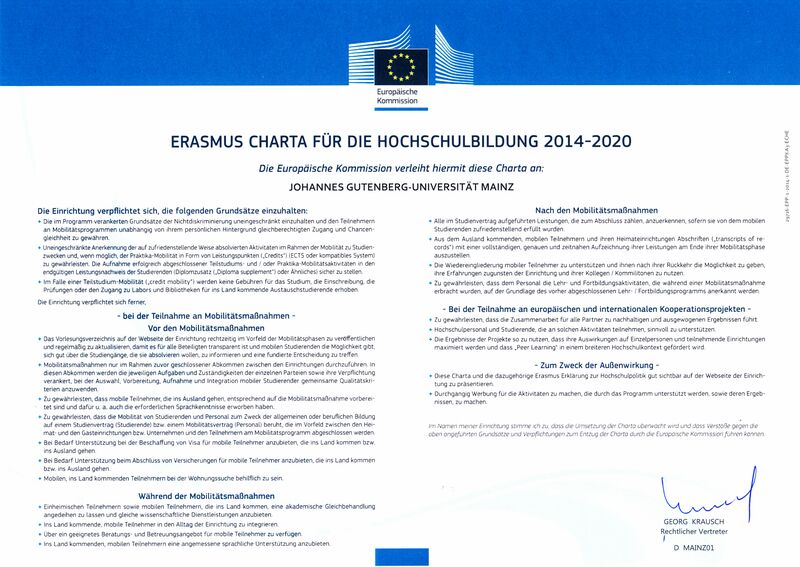 In 2013, JGU was again awarded the quality seal for best practice in mobilities within the scope of the Erasmus program. This project is financially supported by the European Commission. The author of this publication is responsible for its content. The commission cannot be held liable for the information contained herein.